UPPER BACK POSTURE CORRECTOR . The braceability corrector helps to get rid of back, shoulder, neck pain and lower back pain from strains, sprains and muscle spasms. 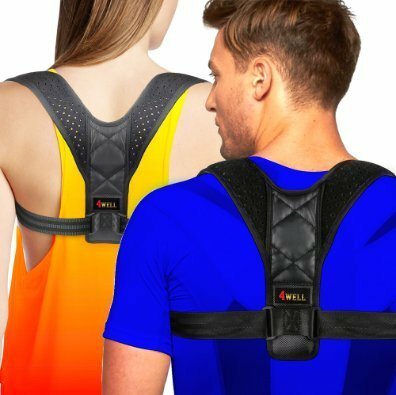 POSTURE CORRECTOR FOR MEN WOMEN. The premium posture corrector straightens shoulders and upper back. A quick way to stop slouching and hunching when sitting with rounded shoulders at a table or computer or walking. COMFORTABLE SHOULDERS SUPPORT. The black elastic posture corrector is made of a thin breathable material You can wear it under clothes. The clavicle brace doesn't cause skin irritation or sweating, can be worn at home, in office, work, gym, yoga ADJUSTABLE POSTURE SUPPORT - UNIVERSAL SIZE. The corrector back brace has adjustable straps thanks to which it fits adults and teens , mans and womans. Fits 28-42 inch small and 40-48 inch in chest circumference. MUSCLE PAIN RELIEVER. Wearing the back straightener for some time develops muscle memory which means you'll keep your back straight even without the posture corrector device.